Participants from Matter of Balance Workshop held in 2018. Now is the time to take control by learning how to prevent falls and to manage falls that may happen. 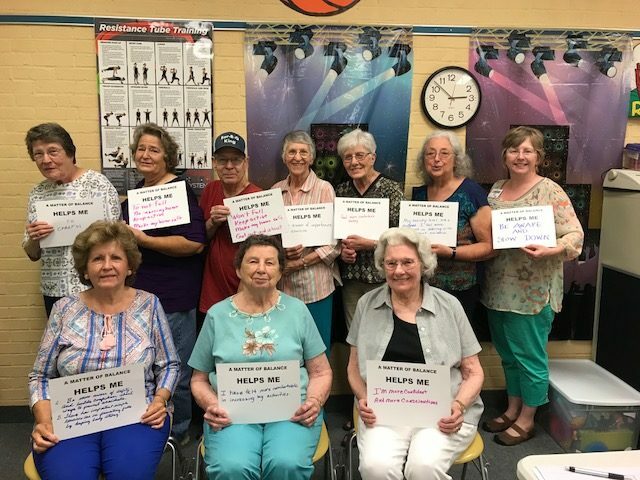 A Matter of Balance: Managing Concerns About Falls a national program sponsored by Centralina Area Agency on Aging, will be offered by N.C. Cooperative Extension of Gaston County and Gaston County Adult Services beginning in February. This program is provided at no cost to participants and valued at more than $800. You will learn how to make changes to reduce fall risks at home, view falls as controllable, increase physical activity, increase strength and balance, problem solve, and set goals. If you are concerned about falls or have fallen in the past – this program is for you! Lowell Community Center, 501 W. First St., Lowell, NC. Registration deadline Feb. 14. Contact Cristy Cummings or call 704.824.0099. Sponsored by Centralina Area Agency on Aging and provided at no cost to participants.